Cipriani® offers professional solutions for outdoor use such as tower lights, trolleys with tower lights and solutions that are easy to install, transport and store. Cipriani® tower lights are ideal for quick and easy deployment and are equipped with a slow road trailer. They are equipped with metal halide or LED lamps, which allow to light uplarge spaces, up to over 4,500 square meters. They represent an ideal professional solution for outdoor use, such as roads and bridges constructions, emergencies, various types of construction sites, musical or sports events and entertainment. What is a tower light? The tower light is a lighting system composed of one or more lights positioned at the end of a collapsible column. 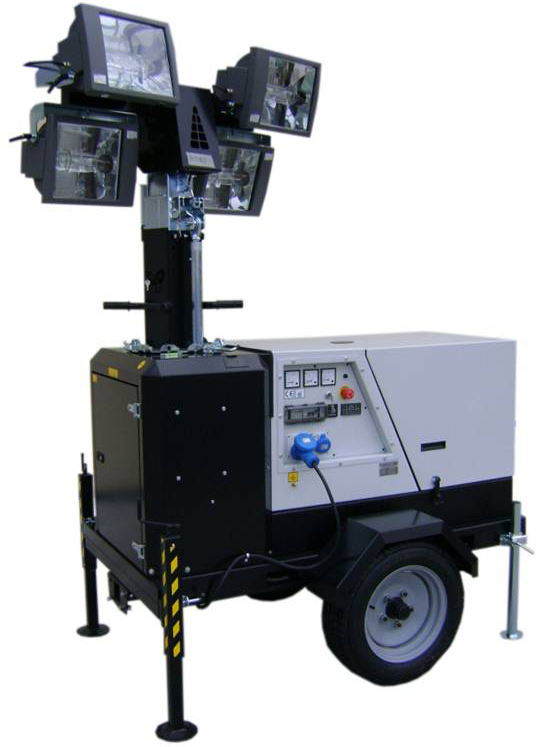 The foldable arm is usually mounted on a trolley with a generator for powering the lamps. The tower lights are mainly used for lighting public events, such as concerts or festivals. They are also useful in emergency situations, such as civil protection rescue operations or other uneasy occasions.